A Single PTC thermal sensor can be used to link several Therma Pro-V fans in a system. An example of how a system might be configured is illustrated in Figure 1. The sensor leads are connected to the bus bar terminal conveniently located near the fans. The PTC is placed at the desired spot in a system and connected by single set of sensor leads. Figure 1 shows how a system can be designed for expansion. 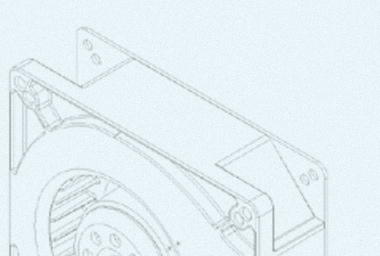 There are open contacts on the bus bars for sensor leads from additional fans and the PTC is attached through a connector to allow for ease of switching. There are PROs and CONs to a single sensor control configuration. Multiple sensors could produce a situation where the fans run at various speeds because one sensor is exposed to a slightly differently airflow and ambient temperature than the another. A single sensor controlling all the TPV fans would produce a uniform response of the fans to the temperature of the system. In addition, the fans running at approximately the same speed will reduce the chance of audible pure tones and various beat frequencies. Another obvious benefit would be the reduction of components, therefore a reduction in cost. A single sensor will eliminate the multiple sensor leads running through the system. The main problem with a single sensor system, stems from the fact that the PTCs used to monitor the temperature are both current and temperature sensitive. The amount of current flowing through the device affects the temperature of the PTC, thus directly influencing the fan speed. When two Therma Pro-V fans are interfaced through one PTC, the current doubles, the heat in the PTC increases, and the fan's RPM rises even though the ambient temperature of the system has not changed. The same theory applies for 3 fan, 4 fans, etc. Eventually, the thermal limit of the PTC is reached, therefore, the fans run at full speed. This means that a particular PTC has to be selected for not only the desired operating temperature range but also the number of fans in the system. Contact our Application Engineering department for more information regarding PTC selection.